​and our triumphs (and struggles) along the way. Ok, so I have to be honest...I didn't think that I had any followers on this site. I think that's why I took some time away, because I didn't think that anyone was reading it. There were no comments, no real feedback...but I just checked my stats for the first time in months and I saw that I actually had visitors! Maybe not many, and I can't tell who is reading what (if anything) or who is actually visiting, but I did see that people had, at least, stopped by. That gives me hope. Not only for this site, but also for a blog that I'm thinking of starting for my sewing endeavor. I am hoping to start an Etsy store where I can sell all my little handicrafts for a small profit. Since I do so much stitching on tea towels and cross-stitching, I thought that I would try my hand at selling these things, rather than have them accummulate in my house. And, since I have all these thoughts that run through my head as far as stitching and ideas and whatnot, I thought that a blog might be just the thing to keep up with those thoughts and ideas. Granted, I am a bit anxious about it, because, obviously, I have a heck of a time keeping up with this site. But, that again, brings us back to the reason why I stopped updating this site in the first place. What a vicious circle. But, here I am, back at my computer, making time to update this site (now that I see that I actually have visitors! ), and, hopefully, get started on my new blog. Two blogs...hummm....guess we'll just have to see how it goes. Not. Actually, I feel way more busy in the summer than I do any other time of the year. Summertime brings about sunshine and warm weather (especially here in Colorado), and that means that we all want to be outside more (unless it's over 85. Then all I want to do is nap). It also means that there are weeds to be pulled, plants to be tended, and outside home improvements that all need to be done that eat up the hours in the day. Not to mention the need to go down into the basement sewing room where it is remarkable cooler, and while I'm down there, I might as well quilt! Plus, there are Cub Scout camping excursions, friends to visit because they are on summer break, and festivals and fairs and ComicCons to attend! The summer is always jammed packed and I constantly seem to be shaking my head, wondering where all the time went. You'd think that with the daylight hours being longer, I'd be able to get more done. Nope. 24 hours is still 24 hours, no matter how much sun there is to be had. All that being said, we are trying to do half days of lessons, but, honestly, it's not going so well. We are both tired and looking for excuses to not do any work. I am trying to revamp the classroom and curriculum so that it works even better for us (because that's what we do as homeschooling parents, always looking for ways to make things easier and better). The Monk is desperately trying to be out in the sun as much as possible, and The Hubs and I are both working really hard to have an excellent crop this season in our garden and mini-orchard, not to mention completing some REALLY big projects outside (thanks to my loving mother who gifted us with some of her inheritance. She's awesome and I love her!). With all of this going on, lessons are...well..not getting done. And I'm trying really hard to not be worried, b/c he is testing higher than grade level and I should really just be happy with that, but I can't help to have some guilt over the fact that we are not being as productive as we could be. I feel as though I'm not living up to someone's expectations (whose, I don't know...just this latent guilt that constantly seems to eat at me). Maybe I should give us a break...not push us so hard and give everything a rest so that neither one of us experience burnout. Maybe I need to reevaluate how to teach him without it actually LOOKING like we are doing school. Maybe we should just have fun. I want to do that, but again, that latent guilt sets in as well the fear of what it's going to look like when I try to get us back on schedule in August...ugh. Ok. I think that it may be time for some parent/teacher conferences with The Hubs. We'll do that over dinner tonight. Right now, it's cloudy, The Monk is exhausted from sneaking his tablet into his room last night and staying up WAY too late playing games (needless to say, I now have the tablet), and I want to do something other than work. So...yeah. Ok...so, once again, time has slipped away from me and I have not posted anything new for a while. However, I do have some really good excuses for why that has happened. Ok. 1st - we went on vacation. I know! It's been a long time and The Hubs and I finally decided it was time, so, in April, we took The Monk on a 10 day excursion to Florida to visit Disney World, Universal, and Legoland (as well as some well deserved time at Daytona Beach!). It. Was. Awesome! 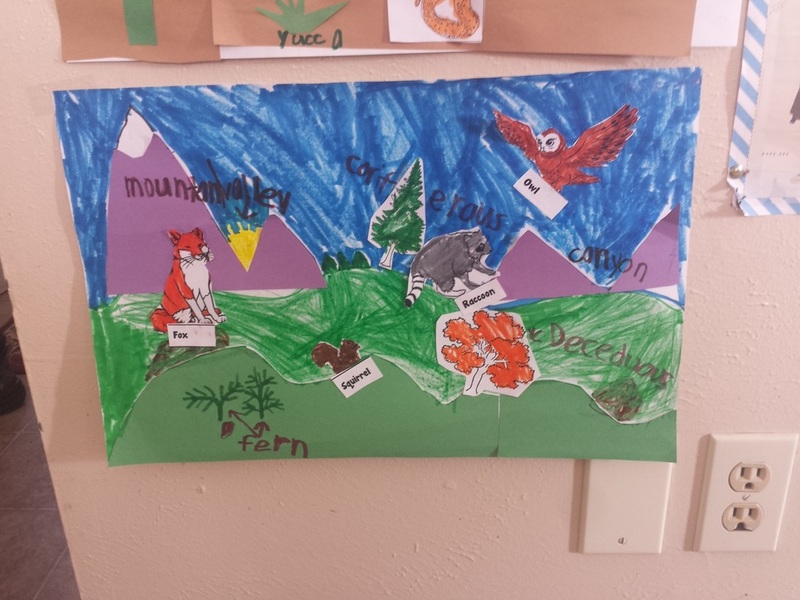 And learning still got done because since we left in the middle of our rainforest biome, we were able to talk about the types of plants that are in FL as well as wildlife (there was an armadillo on our resort property that I had to remind The Monk that he couldn't bring home). So, that took up a good portion of our month in April. Unfortunately, right after we got home from our vacation, The Monk and I had to turn around and head out to Oklahoma for my grandmother's funeral. No school work happened at all during that time, so 3 weeks went by...and then we had to get adjusted to being back home and back into our routine. Needless to say, I told you that I had good reasoning for not posting in a while! Now, since we have that covered, as The Monk and I have been getting back into the swing of things (and the traditional school year is winding down), I have been giving some thought as to how we are going to proceed through the summer as well as how we are going to start our venture into 4th grade. I'll be posting in the next few weeks what the summer is going to look like and what we are going to be doing as another year rolls around (academically speaking). Hope you stay tuned! The warmer weather has got The Monk and I both clamoring to get outside. After winter in Colorado, anyone and everyone is eager to enjoy the sunshine on their faces and the warm air on their skin. So, I have to confess that it has been difficult making it through a whole day of lessons. Typically, by lunchtime, we find ourselves outside, both of us digging in the dirt (both for different reasons). Still, work has been done (I'm not that lackadaisical). 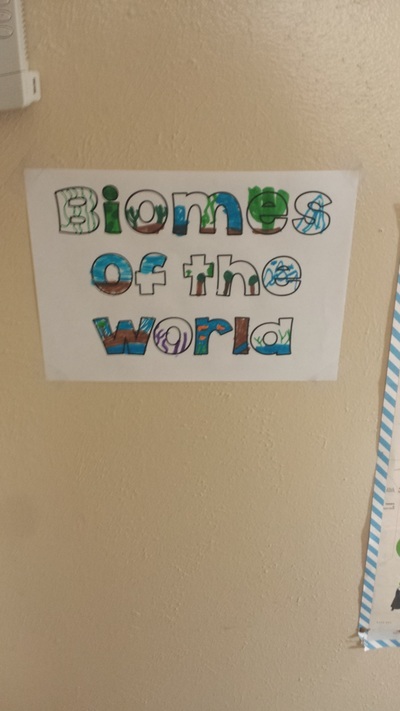 We have continued to work on our biomes unit for science and have had some great discoveries along the way (thank you Planet Earth DVD series!). Instead of doing Biomes-in-a-Box as originally thought, we have done posters instead. They are a little easier and doesn't require us to go out and buy more materials than we need. So far we have done Forests and Deserts. We go to the library to get the books that we need to read about the particular biome that we are working on. 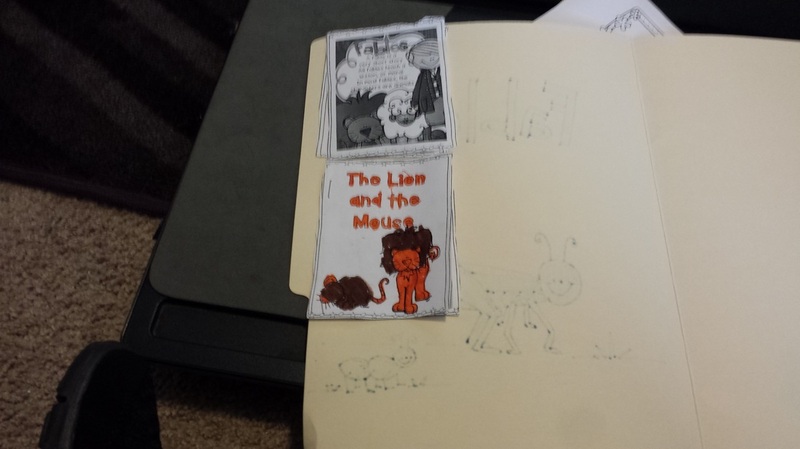 Then we work on creating the flip-flap book that I mentioned in an earlier post. After that comes construction of the biome poster. 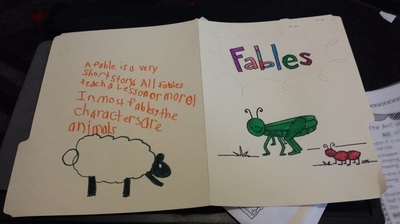 The instructions for that is the same as if he were creating a Biome-in-a-Box. 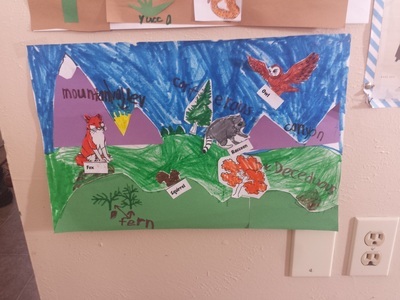 He has to place 3 - 5 animals from that biome (with labels), 3 -5 trees or plants, and at least 3 landforms. 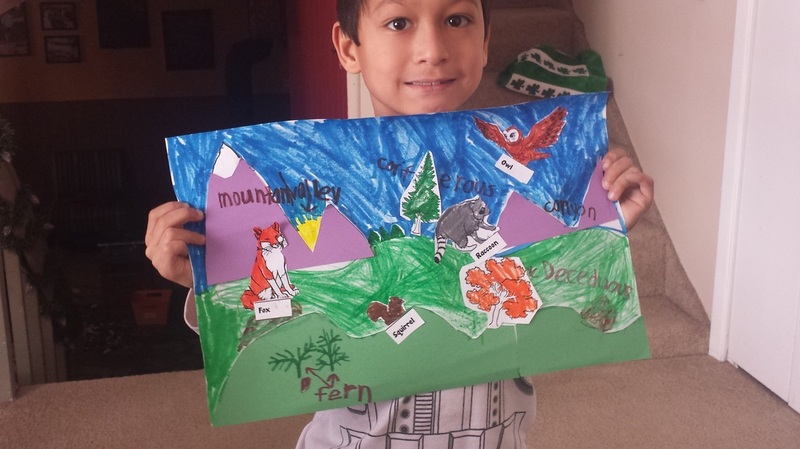 I feel that this really gives him an understanding about each specific ecosystem and it's fun to boot! What is even more great is that, as we are finishing up our Forest biome, the boys had gone on a Scout hike and came back with local owl pellets. Now we get to dissect owl pellets from a lake just up the street and see what the local predators are eating. The Monk thinks it's gross (for now), but I know that once we get going with the dissection, he'll be completely intrigued. He's too much of a scientist not to be. So, here's to bug and crawdad carcasses in containers in my classroom, owl pellets drying out in my kitchen window sill, and trying to make it through a whole day of lessons without the siren song of Spring drawing us away from what truly needs to be done! We don't do reading responses. I know...coming from a former Literacy teacher, that seems like such an odd statement. And we did, at one time. I would download book study units or create my own, and we would fill in the answers to questions, answer multiple choices, and blah blah blah. But, here's the thing: The Monk is a reluctant reader. It takes A LOT of time and consideration to find something that he would be willing to read. So, it's hard for me to justify taking any enjoyment out of reading a book that he might like by forcing him to answer response questions. Now, don't get me wrong, we totally talk about the books and the characters. There are times when we might do a character chart to help keep track of the various persons in a book, and we might do a plot line to help us sort out what is happening in the story, but I have thrown constructed reading responses (at least for fictional books) out the window. When I read, I don't answer questions that make me reflect on the book. I read for the sheer enjoyment of it. I use reading as a way to escape from reality. What purpose would I be fulfilling if I took that sense of imagination away from my son? Yeah, OK, I hear the arguments of teaching him to think critically about what he is reading, about how to analyze author's purpose, and talk about character traits. I get it. 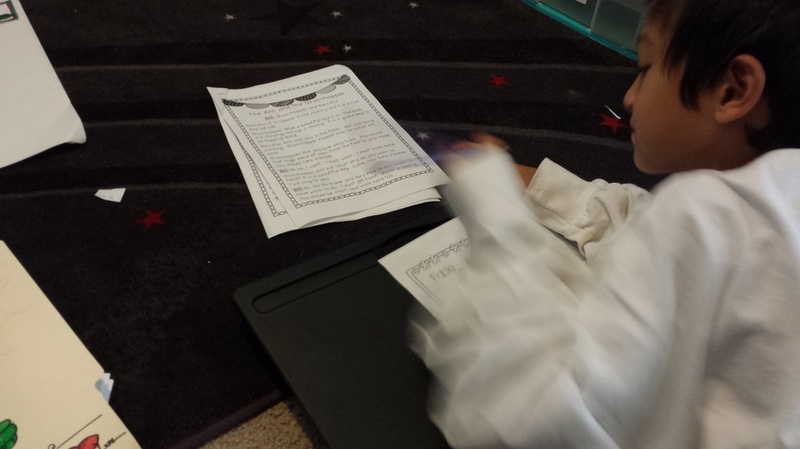 I know all the proponents of reading responses, discussion and analyzing a text. Been there, done that (in fact, I think I still have a hoodie with that on it). But, (as I have argued with myself about this time and time again), The Monk is 8. He doesn't really need to know what Buldeo's purpose was for telling lies in The Jungle Book or what Rudyard Kipling's purpose was for even writing the stories in the first place. He just needs to enjoy reading it. The fact that my 8 yo son is reading The Jungle Book and can discuss the characters and whether they are good or bad is good enough for me. He is reading it independently. He is talking about the differences between Baloo in the book and Baloo in the Disney cartoon. He is enjoying the story and allowing his imagination to enhance his experience. Truly, that's all that's really important when it comes to fictional books (non-fiction texts are a different matter and belong in a different post). As he gets older and we explore deeper, more meaningful and complicated texts, then yeah, maybe, I'll go back to downloading novel studies and reading responses, because, there really is a place for critical thinking about a fictional piece of writing. I know that. But we aren't there yet. And that's OK. One day we will bust out the unabridged, grown-up version of The Jungle Book and analyze Mowgli's growth and how his character changes from beginning to end. One day. Today, we're going to snuggle under a handmade quilt on the porch swing out back and just read. Because we can. I have it so that he also has to make a display card for his boxes, and, upon the completion of the biome-in-a-box, he either has to do a video presentation or a live presentation. Again, I am hoping to prepare him more for future assignments and such. Since we don't focus on grades as this point (I'm think that will probably come later, more late middle school years), I don't have a rubric for this unit, although there are a ton out there for this sort of project. I have to confess that I am pretty excited about this unit as a whole. Knowing that The Monk is excited and that this is right up his alley as far as his interests go, it's going to be wondrous to watch him explore these environments of the world and see what he does with his dioramas. I think that it's going to be super cool. There is a common problem that my son and I share...we both get bored rather easily. Between his ADHD, and my ADD, we both lose interest in subjects or units quickly if neither of us are really engaged. And I know, part of it is my fault b/c I'm the teacher and I should be able to just keep going. But, as my years as a public school teacher taught me - if I'm not engaged, the students won't be either. Which, truthfully, makes homeschooling nice b/c if we get bored, then we can change subjects or whatever and I don't have to explain myself to anyone (well, except maybe The Hubs). We do what we want and what we are both interested in. And, even if it isn't a subject that I'm completely loving but The Monk is - well, it's all about him anyways, so I make it as fun as I can and I get enthused when he is excited about what he is doing. It's infectious. That being said, we have thrown over our study of the continents (for now) for a Road Trip USA unit (found here). I have used some of Erica's curriculum before and we have both enjoyed it, so I'm pretty jazzed about this unit. We tried doing it about a year ago, but The Monk wasn't quite ready for it, so I'm glad that we get to try again. He is much more involved this time and seems to be up to the task! Plus, I think that it will be a great segway into our study of colonial times that I'm hoping to start this summer. All roads are paved with good intentions. And I had them...I really did. But, not long after I posted my last entry, I got slammed with pneumonia (and bronchitis, and a double sinus and ear infection - let's just say I've been REALLY sick). Needless to say, sitting in front of my computer was one of the last things that I really wanted to do. And so, once again, time has passed by me without my every typing an entry or doing the things that I have been promising myself that I would be doing. But, here I am now. My coughing is more manageable, I'm not completely exhausted, and I feel reasonably like a human again. So, once more onto the road that is paved with good intentions. I am still hoping to keep this blog going on a more frequent basis. I some new ideas of postings that I want to do, some crafty things that are coming up (got to get that head start on making Christmas presents), and some curriculum reviews that I've been wanting to write, especially since it is becoming that time of year again where we have to revisit and review what has been working for us and what has not. So, as I am continuing to recover from pneumonia (and everything else that seemed to lay me out), I am hoping to get back into the swing of things (albeit, very slowly), and soon there should be some good stuff coming up onto this site. I hope, for those of you who are actually reading this and following along, despite my rather long extensions of absence, will be here to see what's coming up next. Thanks for staying tuned. I've been in a funk. Things have been so hectic and so stressful that I have not allowed myself the time to keep up on my blog. I get it...bad blogger. I mean, how can I have a website and a blog if I don't actually do anything with it?? That, and honestly, I didn't feel like keeping up with it. The idea of sitting down and sharing my thoughts or what we were doing really was just overwhelming my already exhausted brain. So, I didn't. I have let months and months pass me by without sitting in front of the computer to work on this site. I have allowed the holidays to pass and roll right into the middle of January...ugh. But, upon some reflection, a self-motivational talk, and the reignition of the desire to actually write about what we've been doing in school, here I am. Now, if only I can keep it up!! Apparently we have REALLY been back into the groove of things if I have allowed this much time to pass without making a post! Goodness! Ok, well, let me catch you up: We have started a new unit in reading on Fables (this is turning out really nice for us because a lot of the bedtime stories that the Monk reads are Buddhist fables, so he's able to make connections really nicely). He is particularly enjoying watching the old Disney cartoons that go along with the different fables (I mean, have you seen the old "Grasshopper and The Ants" recently? It's definitely NOT PC!). Still, he likes them (anything that has to do with being able to watch cartoons), and they are a fun break during our lessons. I was a public school teacher for 6 years in a very urban middle school for both 7th and 8th grade. As the red-tape got thicker and teaching became more of a business rather than a place to prepare young minds to enter into the world, I decided that if I was going to work that hard to give an education to someone, it should be my own son. So, my adventures in homeschooling has begun.